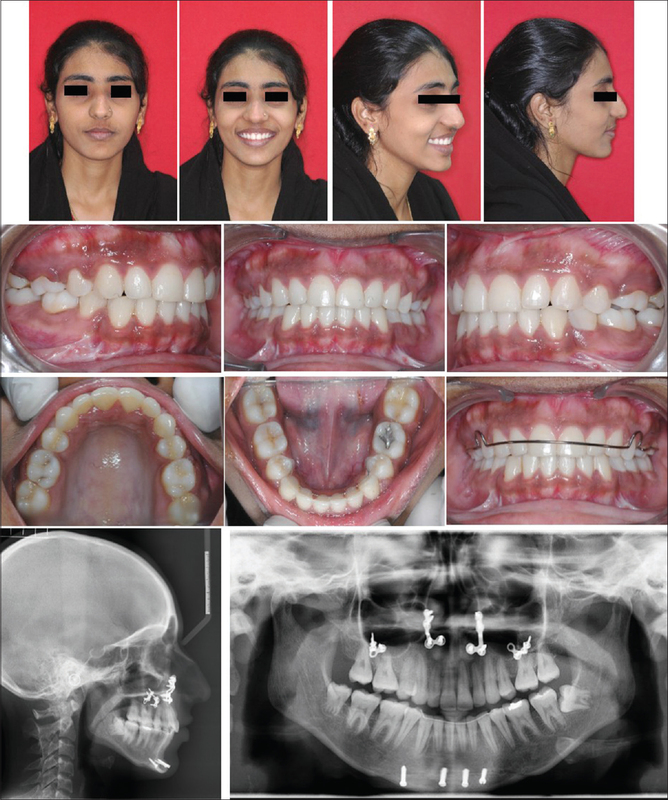 Skeletal Class II malocclusions with vertical maxillary excess (VME) present with an amalgamation of several problems pertaining to psychological, esthetics, and function. The optimal treatment plan in such cases includes a synchronized orthodontic-surgical approach through superior repositioning and setback of maxilla by means of Le Fort I osteotomy and augmentation genioplasty. This case report describes a multidisciplinary approach in the successful management of a patient with VME to achieve superior esthetics and function. Vertical maxillary excess (VME) is an unambiguous clinical entity with characteristic excessive gingival display and progressive downward and backward rotation of the mandible which makes the face appear longer and unesthetic. Numerous methods have been proposed in treating skeletal Class II malocclusion with VME and gummy smile. In growing children with VME, early vertical control can improve the facial appearance. However, in adults, the preeminent solution is maxillary impaction and setback through Le Fort I osteotomy. 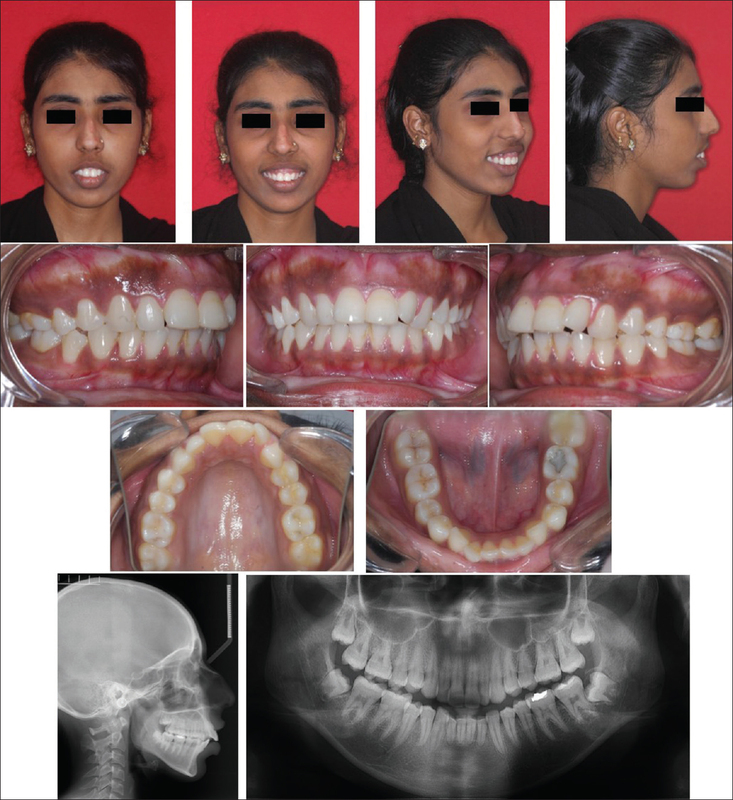 The following case report demonstrates a therapeutic protocol in the management of VME in a Class II patient by combined orthodontic-surgical approach. A 21-year-old female reported to the Department of Orthodontics and Dentofacial Orthopaedics with a chief complaint of forwardly placed upper front teeth. No history of illnesses or trauma was elicited by the patient. Extraoral examination revealed a hyperdivergent facial pattern, convex facial profile, and average nasolabial angle. In frontal view, the patient exhibited increased upper facial height and excessive gingival display during smile. Intraoral examination revealed ovoid maxillary arch and mandibular arch with crowding in the anterior region. The patient exhibited Class I molar and canine relation on the right side and Class II molar and canine relation on the left side with overbite of 1 mm and overjet of 5 mm. The lower dental midline was shifted to the left by 2 mm with respect to the upper dental midline. A function shift was noted to the right side on closure due to the presence of premature contact in relation to 23 and 33 [Figure 1]. Model analysis revealed arch length–tooth material discrepancy of 2 mm in the upper arch and 6.5 mm in the lower arch. There was a Bolton's discrepancy of 4.9 mm overall maxillary excess. Pretreatment orthopantomogram indicated that the patient was in her permanent dentition stage with no missing or supernumerary teeth. Unerupted third molars were present in both the jaws. Cephalometric evaluation revealed skeletal Class II with prognathic maxilla (SNA-85°) and retrognathic mandible (SNB-74°) on a high mandibular plane angle (FMA-33°). The upper incisors were upright and lower incisors were proclined owing to dentoalveolar compensation. The upper anterior and posterior dentoalveolar heights were increased. Upper anterior facial height was also found to be increased indicative of VME. 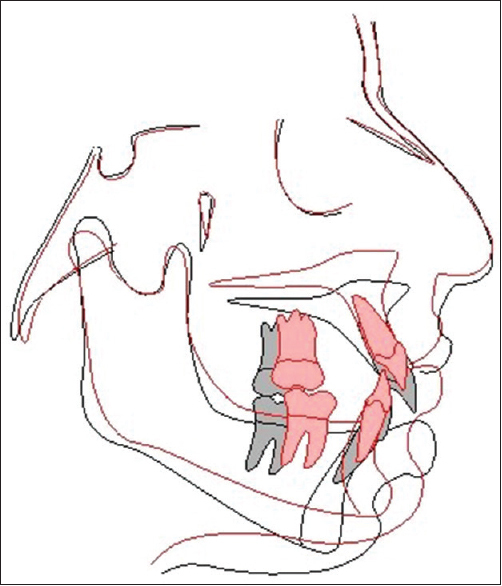 Based on the investigations, the patient was diagnosed as Angle's dentoalveolar Class II division 1 subdivision malocclusion on a Class II skeletal base attributing to prognathic maxilla associated with VME and retrognathic mandible on a high mandibular plane angle with crowding in the upper and lower anterior regions. Three treatment options were discussed with the patient. After analyzing the cost–risk–benefit of the three options, the patient chose orthognathic approach. Based on the clinical and radiological observation, it was apparent that the Class II deformity was primarily due to a prognathic maxilla in both vertical and anteroposterior planes and a retrognathic mandible. 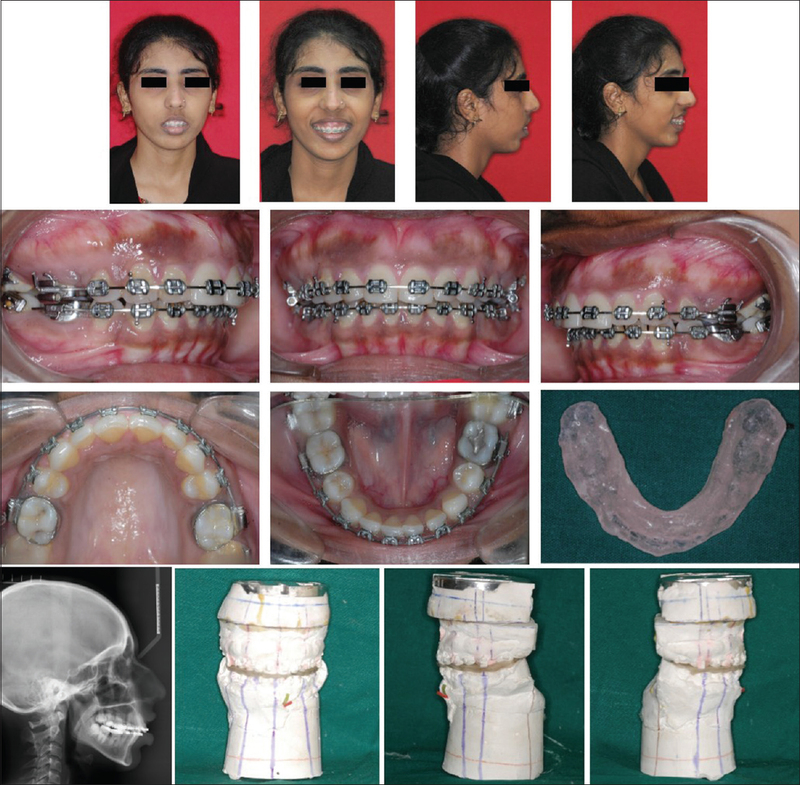 Thus, presurgical orthodontic treatment was planned involving extraction of 15, 25, 34, and 44. The surgical phase included maxillary impaction and setback along with advancement genioplasty. Orthodontic therapy was initiated with preadjusted edgewise prescription. After extraction of 15, 25, 34, and 44, leveling and alignment was done sequentially with 0.016 NiTi, 16 × 22 NiTi, and 19 × 25 NiTi archwires. Retraction was performed with friction mechanics on rectangular stainless steel archwires 19 × 25. Intentional molar mesialization resulted in moderate anterior retraction and an end-on molar relationship. Once space closure was completed, facebow transfer was performed and the casts were transferred to a Student Articulator of Munich (SAM) III articulator. A surgical splint was fabricated and then the patient was subjected to surgery [Figure 2]. In the surgical phase, a Le Fort I osteotomy was done with maxilla positioned superiorly by 5 mm and posteriorly by 4 mm and advancement genioplasty of 5 mm. Postsurgical correction was maintained by rigid fixation. Finally, postsurgical orthodontics was carried out for finishing and detailing and midline elastics on 0.018 SS. In the retention phase, a Beggs' wrap around retainer was placed in upper arch and fixed lingual bonded retainers in lower arch [Figure 3]. At the end of treatment, the patient had a pleasing smile, well-balanced facial thirds, and stable occlusion resulting in Class I canine and molar relationship with normal overbite and overjet. The disocclusion of molar relationship on the left side was due to attrition caused by the end on relation which was present in the pretreatment. 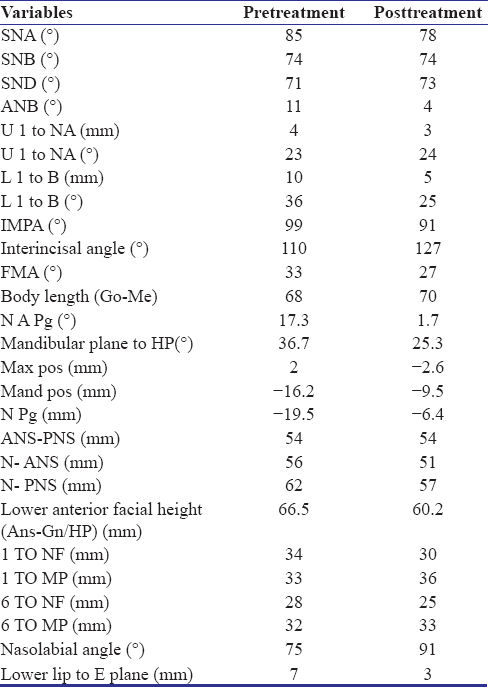 Superimposition of the pre- and postorthodontic cephalometric tracing illustrates the amount of impaction and setback of the maxillary segment, autorotation of the mandible, and associated dental and soft-tissue changes [Figure 4] and [Table 1]. The occlusion remained stable and no skeletal relapse was recorded during the 2 years of follow-up [Figure 5]. Long face syndrome is an apparent skeletal dysplasia which often presents as VME with increased anterior facial height as a common denominator and a gummy smile. The facial esthetics get even more compromised when combined with a steep mandibular plane angle due to the downward and backward rotation of the mandible which makes the associated mandibular deficiency appear worse. Treating VME with anterior open bite or a tendency for open bite is less sophisticated than to treat when its combined with it. The ideal treatment approach includes maxillary setback to aid in correction of the maxillary prognathism and superior repositioning of the maxilla following which there is a counterclockwise mandibular rotation which concurrently advances the mandible positioning it forward. Further, the retrogenia is addressed by genioplasty. This approach significantly decreases the facial height and balances the facial profile considerably. The skeletal stability and esthetic changes are very promising in this treatment approach., It has been noted that the facial architecture is considered beautiful only if the chin is tangential to the 0 meridian. Thus, an apparent profile deficit addressed through genioplasty is a reliable adjunctive procedure in restoring the facial harmony.,, The favorable changes include lip competency, chin fullness with good bone remodeling above the repositioned chin segment, and increase in symphysial bone thickness. Some studies have reported that Le Fort I osteotomies can cause shortening, flattening, and thinning of the upper lip; alar base widening; and upturning of nasal tip and decreased vermilion show.,, However, in the present case, precautionary alar base cinch procedure was done to mitigate the resulting alar widening. Furthermore, it was observed that the nasolabial angle was virtually unchanged due to the extraction pattern indicated. Maxillary superior and posterior repositioning by Le Fort I osteotomy is one of the most versatile and stable orthognathic surgeries in treating patients with VME when executed with proper treatment planning. In addition, augmentation genioplasty can be done if it coexists with a chin deficiency. An interdisciplinary approach with good coordination between the orthodontist and oral maxillofacial surgeon can enhance the overall treatment outcome. Paik CH, Park HS, Ahn HW. 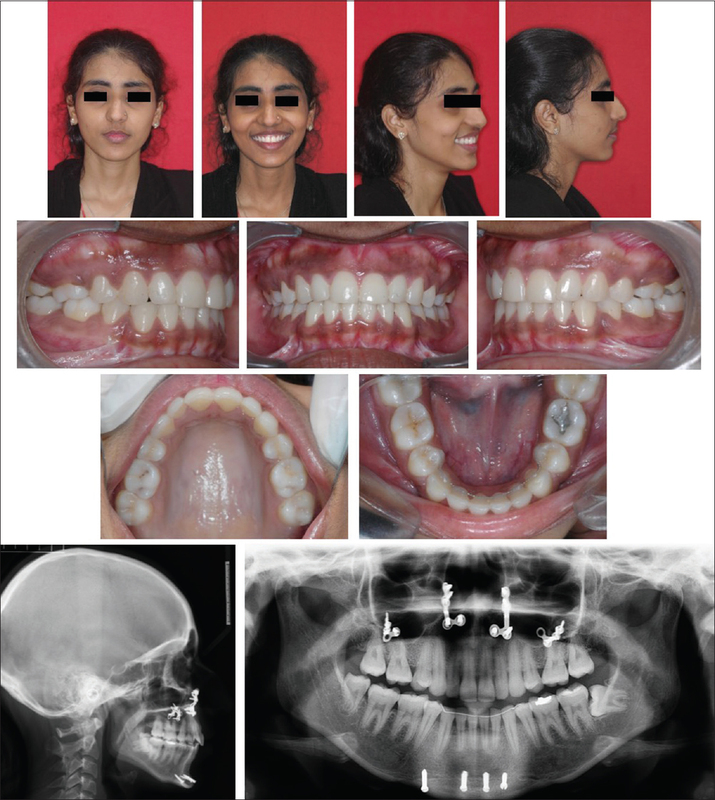 Treatment of vertical maxillary excess without open bite in a skeletal class II hyperdivergent patient. Angle Orthod 2017;87:625-33. Proffit WR, Phillips C, Turvey TA. Stability following superior repositioning of the maxilla by LeFort I osteotomy. Am J Orthod Dentofacial Orthop 1987;92:151-61. González-Ulloa M, Stevens E. The role of chin correction in profileplasty. Plast Reconstr Surg 1968;41:477-86. Wolfe SA, Rivas-Torres MT, Marshall D. The genioplasty and beyond: An end-game strategy for the multiply operated chin. Plast Reconstr Surg 2006;117:1435-46. Proffit WR, Turvey TA, Moriarty JD. Augmentation genioplasty as an adjunct to conservative orthodontic treatment. Am J Orthod 1981;79:473-91. Mitchell C, Oeltjen J, Panthaki Z, Thaller SR. Nasolabial aesthetics. J Craniofac Surg 2007;18:756-65. Yamada T, Mishima K, Moritani N, Janune D, Matsumura T, Ikeya Y, et al. Nasolabial morphologic changes after a LeFort I osteotomy: A three-dimensional anthropometric study. J Craniofac Surg 2010;21:1089-95. Wang YC, Ko EW, Huang CS, Chen YR. The inter-relationship between mandibular autorotation and maxillary Lefort I impaction osteotomies. J Craniofac Surg 2006;17:898-904. Collins PC, Epker BN. The alar base cinch: A technique for prevention of alar base flaring secondary to maxillary surgery. Oral Surg Oral Med Oral Pathol 1982;53:549-53.